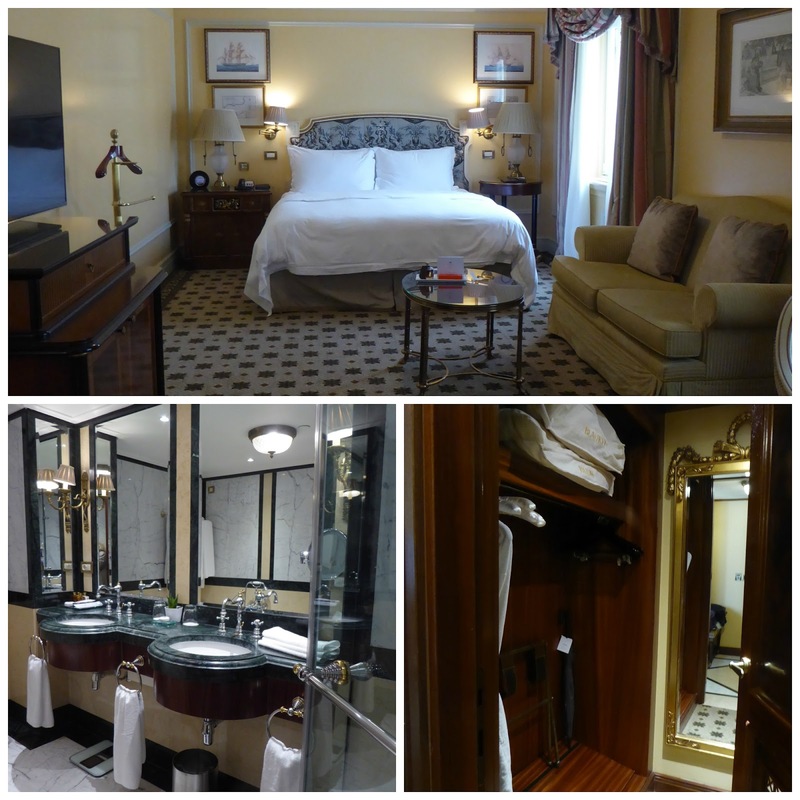 Athens Grande Bretagne ~ The Butler Can Do It. . .
We declined the doorman's offer to carry our bags the short distance from the taxi into the palatial lobby. Our two bags were small - we were in Athens for a long weekend. We could manage. But when the young receptionist, who looked like a Greek Goddess reincarnate upgraded us to a junior suite and said, "Your butler will take your bags and show you to your room," who were we to refuse? The Butler, with our bags in tow, led us to our 7th floor junior suite on the 'Butler Floor' of the undeniably posh Athens Grande Bretagne Hotel. Less than 10 minutes into our stay we knew why this property is part of the Luxury Hotel Collection and consistently rated by travelers as one of the top hotels in Athens. This stay was going to be memorable. 'The Butler' was one of several staff members assigned the responsibility of responding to the wants and needs of those of us staying on the designated butler floors. He seemed a bit bellman and concierge rolled into one. Anything we needed 24/7, just call his number, he said as he handed us his business card. 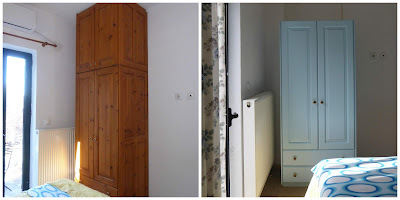 He'd shown us about our spacious room, opening curtains, explained the wi-fi and the room-card operated electricity (common throughout Europe). Did we need reservations? Recommendations? Help with anything. . .just call. Problem was that when one lives their lives without a butler, it is difficult to think of something we needed 'buttled' as we referred to his services from then on. "Why doesn't our house look like this," asked The Scout with a big sigh as we inspected our Athenian digs. Suffice to say, the room itself -- had we never stepped outside its door -- would have been a treat of a getaway. The attention to detail was amazing. Take that down comforter on the bed in the photo below: When made up by housekeeping the top is folded about 45 cm towards the foot of the bed then rolled back over itself to 5 cm from the edge of the fold. This, I learned from the in-room hotel magazine, lets the guest snuggle into the bed using the minimum amount of effort. My kind of bed! Housekeepers use a 10 point checklist when inspecting the made beds. The layers of history at this hotel are almost dizzying. And that was a stronger enticement for us than the luxurious accommodations. 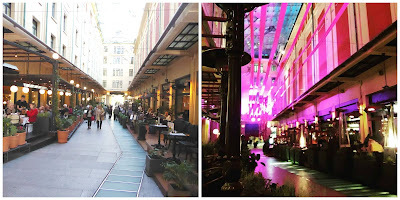 As we dined in the Winter Garden, off the lobby, we wondered how it looked in 1842 when it was built as the 90-room 'Stadtpalais' (majestic residence) of Antonis Dimitrio. His home was constructed across from the Palace of King Otto barely more than a decade after Greece achieved its independence from the Ottomans. Or as we sat at the bar in Alexander's Bar, in the shadow of the hotel's treasured 18th Century tapestry of Alexander the Great entering Gaugamela, we pondered the massive effort undertaken by Savvas Kentros, who purchased the home for 80,000 drachmas and converted it to a hotel. Who's walked here before us? We wished the walls could talk about the decade of the 1940's when first the hotel was evacuated in October of 1940 to be used as governmental headquarters of the King, the Armed General Staff and the Allied Forces. Or April 1941 when the invading Germans took it for the headquarters of their Wehrmacht. Then, with the liberation of Greece in 1944, it became the seat of the new interim government and British forces. By the late 1950's the hotel was back to being a hotel, renovations and ownership changes marked the subsequent decades. Its most recent $100 million renovation in 2003 created the property as it today. We often sing the praises of hotel and airline loyalty programs. We are long-time members of the Marriott Hotel's loyalty program, which has become BonVoy the loyalty program of the merged Marriott and Starwood Hotel chains. The upgraded room was part of the loyalty program benefits and an example of the benefits that can be had from such programs. The room we booked was in the 250 euro ($280US) per night range; the junior suite on the Butler Floor we were upgraded to was about 350 euro ($393US) a night. 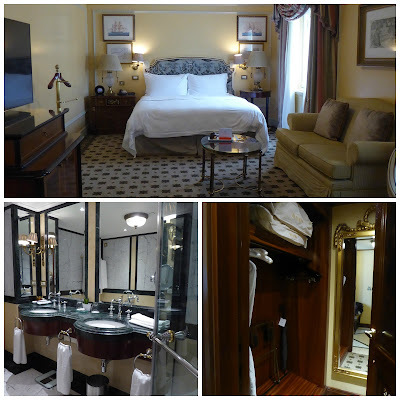 We used accumulated loyalty points -- 60,000 a night for 180,000 total - to pay for the room. 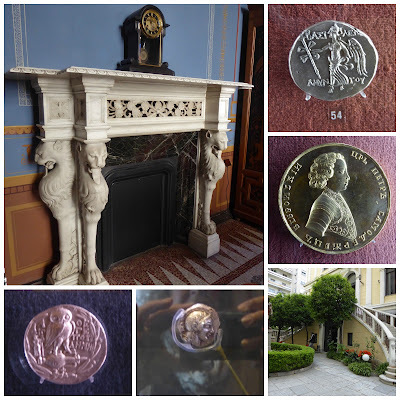 Our out-of-pocket cost was 4 euro a night for the room tax levied in Greece on hotel stays. If you find yourself in Greece - even if you don't stay at the hotel - we'd recommend a drink or a meal at either the Grande Bretagne or its sister Luxury Collection Hotel, the King George, next door. Both are across the street from Syntagma Square. That's it for this week. We are back at our Stone House on the Hill in the midst of springtime projects. We are keeping busy and that is good because we can't leave Greece. No joke. And not our idea. But that's a topic to tell you about next week. Hope to see you back then and bring a friend or two as well. Waiting to cross a street near Syntagma (Constitution) Square in the heart of Athens, a person focused on his mobile phone while balanced on a lime green scooter came whizzing down the sidewalk behind us. A car in front of us speeded up, ran a red light and could have taken out a few pedestrians had we not been slow to react to the 'walk' signal. To our side the 'hop-on, hop-off' buses vied with a parade of taxis for a spot to stop near the famous square. On this Saturday afternoon the streets were crowded and the sidewalks were crammed with shoppers - we could tell they were shoppers by the name-brand logos printed on the bags they carried. Chatter and laughter wafted from tables at open-air cafes. A decade after the economic crisis sucker punched this country, you can feel the vibe, the life, perhaps even the soul of this popular central area returning. This part of downtown is night-and-day different from even a few years ago when shops were shuttered, businesses closed and the streets in once-busy commercial areas empty. Time and time again during a long-weekend here earlier this month, we were touched by this upbeat rhythm in the neighborhoods we explored. We avoided the 'tourist' sites this trip and set out to see the 'every day'. To be sure, there is a lot to Athens and economic recovery isn't going to be achieved uniformly or immediately but we could tell the areas of the city we visited are on a definite upswing. Staying in a hotel at Syntagma Square we remarked on the quietude of the place that less than a decade ago gained notoriety -- much like Cairo's Tahrir Square during their Arab Spring -- when Athenians protested and rioted here as the economy tanked and European Union economic sanctions kicked into gear. Friends who witnessed first-hand such riots from the same hotel in which we stayed say they'll never return to Athens. It is a shame, that attitude - because that was so then, this is so now. We headed west from Syntagma Square on Ermou Street, one of our favorite routes in this sprawling metropolis. The 1.5 kilometer road, named for Hermes, the god of commerce, leads to Kerameikos, (ceramicus) the old potters' quarters archeological site. The street, ranked among the top five most expensive shopping streets in Europe and among the top 10 world-wide, begins as a pedestrian zone at Syntagma Square, a feature that makes for excellent 'window shopping'. Stretching for several blocks are stores selling shoes, jewelry, specialty items and brand-name children's, women's and men's clothing. Street vendors set up shop in front of the stores offering everything from eats to books. You really could shop until you drop and never leave this street. We love to walk it before the stores have opened when the sidewalk vendors are just setting up shop and again late in the evening when the buskers set up to entertain late into the night. And then several blocks later there sits in the middle of Ermou Street an ancient church. Once you pass this small square, it isn't long before the pedestrian zone ends and you are back on rather narrow sidewalks. This Byzantine Church of Panaghia Kapnikarea is believed to have been built about 1050 on the site of an ancient temple to Athena or Demeter. Church of Panghia Kapnikarea - Ermou Street, Athens. Ancient Agora - once the hangout for the likes of Plato and Socrates, this historic site is a popular stop for tourists. So large and encompassing are these old grounds between Monastiraki and the Acropolis, that Lonely Planet guidebook's self-guided tour advises it will take two hours to complete. Just a short distance away are the ruins of the Roman Agora, a commercial center dating back to the first century BC. Julius Caesar started the project and Caesar Augustus finished it. Perhaps the most famous of its remaining structures is its Tower of the Winds, a handsome eight-sided marble structure that once served as a water clock, sundial and weathervane. Our focus this outing was on modern-day markets so we bypassed the ancient. We began with a stroll through Monastraki Square, named for the 'little monastery' that sits to the side of its square. While the square still has a fruit vendor or two and boasts a weekend 'antique' market, the rest of its small shops could better be described as a tourist-shop arcade. You want a souvenir? You'll find it on the narrow street flanked by shops offering everything from key chains and post cards to mass produced art work, 'traditional' leather sandals, and women's wear. If you want Army camouflage gear, you'll find it at a shop here. You'd need hours to rummage through the display tables that sprout on Saturday mornings in the plaza. There are bona fide antique stores that front the plaza and operate daily but the weekend brings a hodge-podge of sellers who display piles of old used 'stuff' on folding tables. Somewhere within them, there's likely an antique but we didn't have the desire or patience to try looking. We left Monastiraki and strolled several blocks on Athinas Street to Athens' enormous Central Municipal Market that also goes by the names of Dimotiki (public market) and Varvakeios (a long ago hero) Market. Now this was real Athens - not a tourist item in sight and no arts and crafts. It was serious food for serious shoppers. We did spend a lot of time strolling the aisles - which is best done in closed-toed shoes as they are wet and somewhat slippery on the meat and fish side of the street. 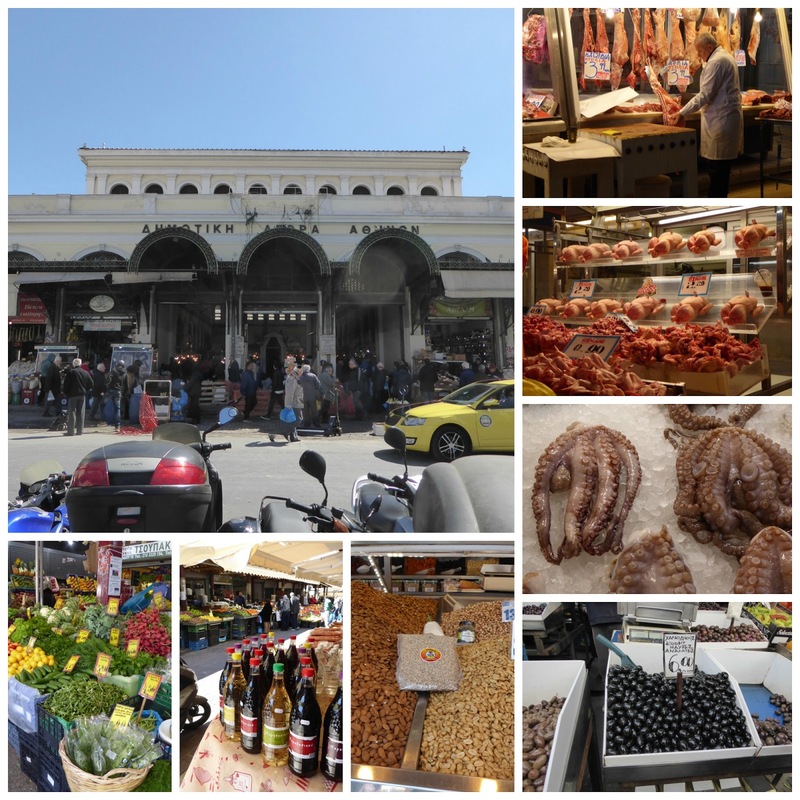 We suspected the food was excellent at the three small cafes that operate within the market but we were saving ourselves for dinner with friends, long-time Athenians. And were we ever glad we did as they introduced us to a café tucked up in the Plaka area near the Roman Agora - a café that got its start back in the 1930's and is still incredibly popular today. It served authentic Greek 'village' food -- and Taverna Platanos is one we'd recommend if you find yourself wanting a bit of good 'home-cooked' flavor and presentation. Now before I sign off, I need to circle back to that mention of the lime green scooter that I told you about in the opening paragraph. Electric Lime Scooters debuted in the city in January. Using an app uploaded to your phone you can unlock a scooter, use it and leave it on the street at the end of your ride. The cost is 1 euro plus .15 cents for every minute. They can travel at a rate of 25 km an hour - yikes! 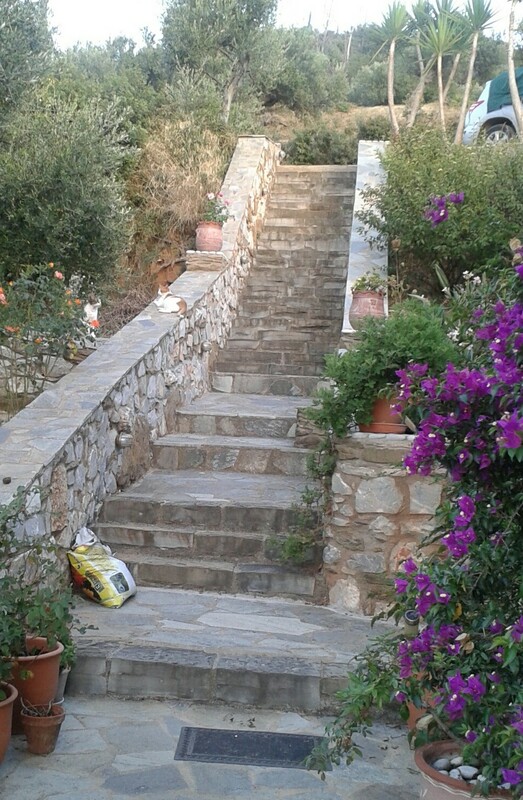 We still prefer walking but keep it in mind if you find yourself in Athens. Okay, so I know I've been telling you that being an ex pat in Greece is one grand adventure. And in many ways living in the midst of Kalamata olive country in the southern Peloponnese is an adventure. It is most certainly a doorway to other travel adventures as well. Yet, (I suspect many of our ex pat friends here would agree) in many ways day-to-day life could be more aptly described as being a mix of madness and mundane. That seems a fitting way to begin a report on what's been happening at our home called, The Stone House on the Hill. While I often post updates on Facebook or Instagram, many of you who follow the blog, have asked, "What is happening at the house?' So looking back over the last six months, here's what we've been doing when not having grand adventures. Every other home on our street -- all four of them -- had some form of entry gate. Two black,one blue, one green. Except us. I'd collected photos of the ornate types of gates we had in mind. He brought a catalog of more ideas. We agreed on a design, or so we thought. 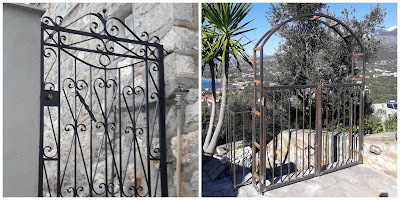 Somehow 'the ornate' part of the gate got left behind and we got a very mundane entry gate.
. .that I will admit drove me a bit into a fit of madness (both anger and crazed) but then -- as with many things here -- it was time to put the madness aside and meet the challenge! 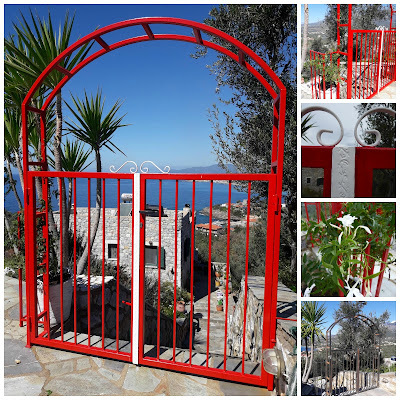 Finished gate with newly planted jasmine vine: Welcome! 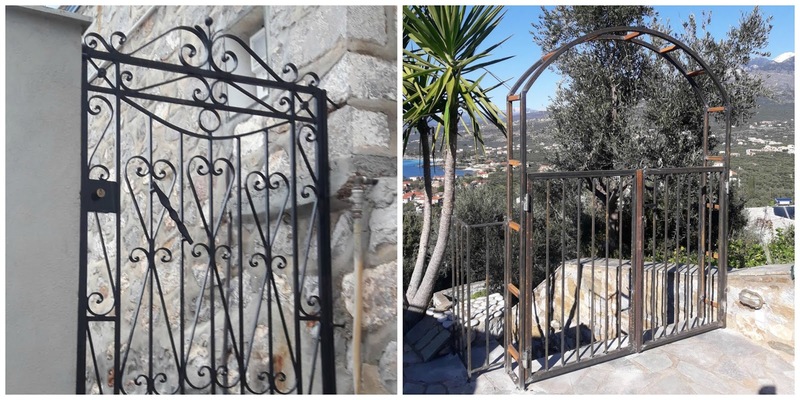 The gate's builder said he'd left it plain because it would have detracted from the view. That does make sense. So we've framed the view with bright red and white paint and someday a jasmine vine will loop over its arbor. I've come to love my little red gate. I perhaps am smitten with my red gate because I had envisioned (at the same time we were talking about the ornate gate) having a small arbor built over our vegetable garden so that we can this year shade the plants from the cruel Mediterranean summer sun. 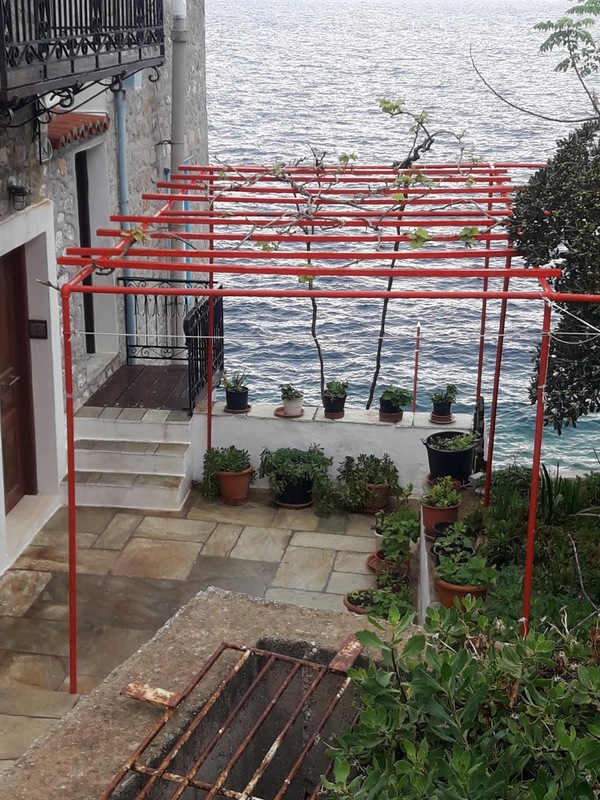 Last fall while exploring Hydra island with visiting houseguests of ours I'd spotted this charming tiny red arbor, pictured above. That was just what we needed. Again, I showed the photo to the metal man who nodded his understanding. He took measurements. All was good; o la kala, as we say here. 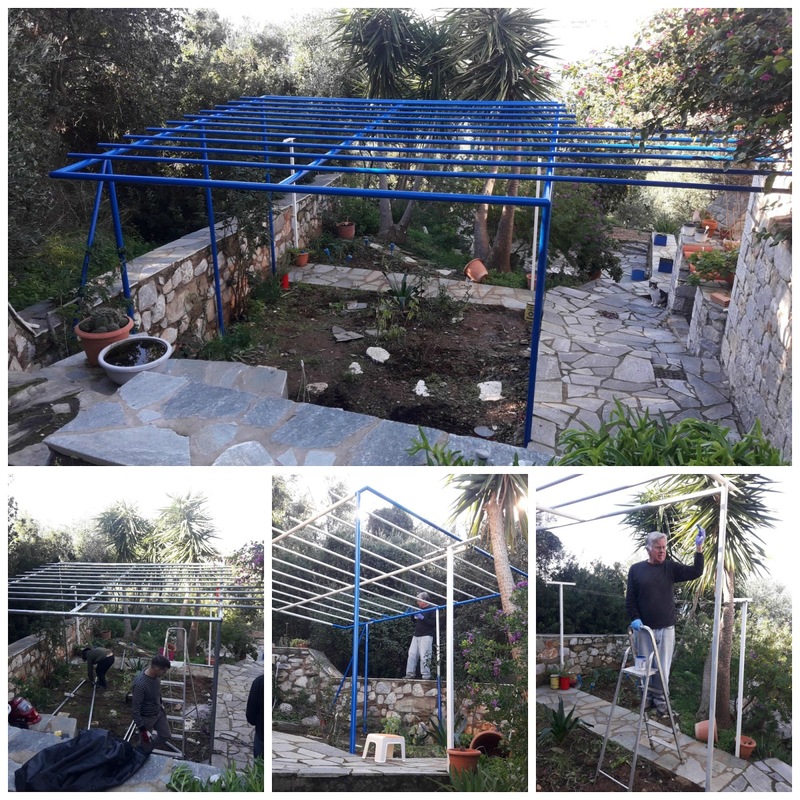 I wasn't home when the construction began on this but arrived as the workmen were putting the finishing touches on 'the structure' that now dominates our side yard. The Scout, being the taller of us, was tasked with painting it (we'd thought we were getting the small version so had told the builder we would paint it ourselves). On the bright side, we don't worry about earthquakes any longer as this baby will hold the house up for sure. We hope the bougainvillea will soon cover a good deal of it and a grape vine has been planted at the opposite end. . . I'll keep you posted on this one. Yes, mundane tasks sometimes feel like sheer madness. 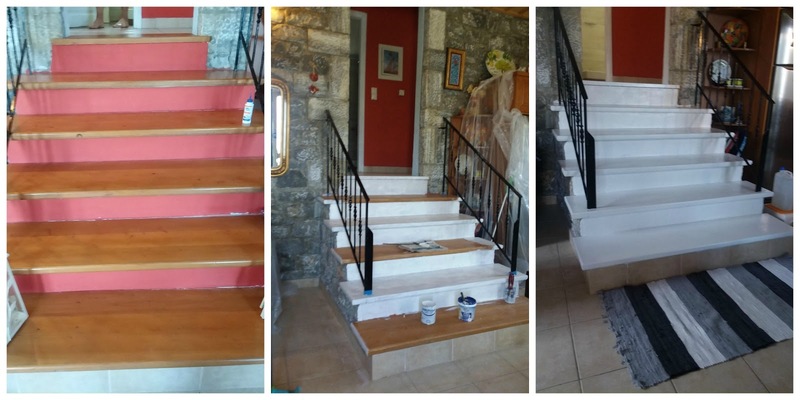 Our paint job of four years ago had faded and we were inspired by the bright white stairway in a hotel we'd stayed at last summer. 'Couldn't be that bad,' we told ourselves. 'A bit of sanding, a coat or two of paint.' 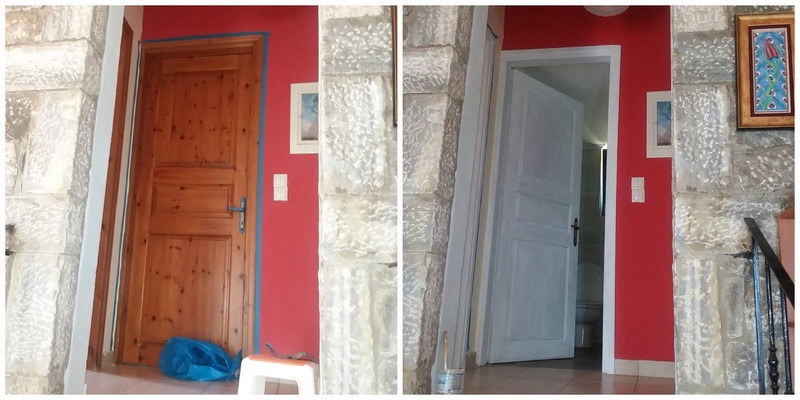 Let's just say it took several days to get the sanding and the painting to look like that we'd seen in the hotel. In the end we were pleased, but it did take a bit more talent than we'd expected it to require. Once we had the stairs done, it was time to tackle the doors. Stone houses built the time ours was, now 14 years ago, were decked out in pine. . .doors, windows, cupboards and cabinets. While stone is easy to come by here, wood isn't. The interior reminded us of the design of cabins built amidst, and from, pine forests in the Pacific Northwest. The doors looked old. They looked dated. And anyone can do a chalk paint wash, right? We finally finished all six interior doors and their frames, but this is one of those projects that had us painting for days. . .it sounded so mundane but it became sheer madness. Our most recent project was a joint effort - we helped do heavy lifting but turned the painting over to a professional. We'd lived with the odd little closet/drawer/storage unit in the master bedroom -- another in natural pine -- for as long as we could stand it. The top section was so high we never used it, so moved it to our storage room where it now stores the olive harvest equipment. And as my father, a housepainter by profession, used to say, what a difference a coat of paint can make! This project was sheer joy and it was madness that we didn't do it sooner! So that ends our behind-the-scenes look at what's been happening at The Stone House on the Hill. We've got painting projects coming up this spring but managed to squeeze in a bit of travel the last few weeks, including a luxurious long weekend in Athens. If you are planning a trip to Greece anytime soon, it would be a shame not to include Athens in your itinerary! I'll tell you a few reasons why next week.